Krylov solvers that hide latencies and avoid communication. The current generation of iterative methods give a poor performance on modern hardware since communication and synchronization costs dominate over the cost of the floating point operations. We are working on communication avoiding and hiding in iterative Krylov methods and introduced so-called pipelined Krylov methods where the latency associated with dot-products is hidden behind other computations. It offers a much better performance in strong scaling experiments. We are currently also working on high-arithmetic intensity Krylov methods that are build on top of kernels that can be SIMD vectorized. W. Vanroose, P. Ghysels, D. Roose, and K.Meerbergen, Hiding global communication latency and increasing the arithmetic intensity in extreme-scale Krylov solvers, Position Paper at DOE/ASCR workshop on Applied Mathematics Research for Exascale Computing. August 21-22, 2013, PDF. T. Ashby, P. Ghysels, W. Heirman, and W. Vanroose, The Impact of Global Communication Latency at Extreme Scales on Krylov Methods Springer Lecture Notes in Computer Science, proceedings of ICA3PP-12, (2012). Bottom-up models in systems biology. D. Draelants, D. Avitabile, and W. Vanroose, Localised auxin peaks in concentration-based transport models for plants, submitted to Proceedings of Royal Society B (2014). PDF. D. Draelants, W. Vanroose, J. Broeckhove, and G. Beemster, Influence of an exogeneous model parameter on the steady states in an auxin transport model, 4th International Symposium on Plant Growth Modeling, Simulation, Visualization and Applications (PMA) (2012). We are developing methods to solve the d-dimensional scattering Helmholtz and Schrödinger equations based on multigrid. B. Reps, W. Vanroose, and H. bin Zubair, GMRES-based multigrid for the complex scaled preconditoner for the indefinite Helmholtz equation, Numerical Linear Algebra with Applications, Submitted, (2013). PDF. Multiscale Methods for Kinetic Models. We are developing new numerical lifting operators for problems described by the Boltzmann equation. Y. Vanderhoydonc, W. Vanroose, C. Vandekerckhove, P. Van Leemput, and D. Roose, Numerical lifting for lattice Boltzmann models. chapter in "Novel Trends in Lattice Boltzmann Methods: Reactive Flow, Physicochemical Transport and Fluid-Structure Interaction". Bertham Publisher, (2012). Solvers for Nonlinear Schrödinger equations. Nonlinear Schrödinger equations are used to model a wide range of applications. We have developed efficient solvers that scale optimally. 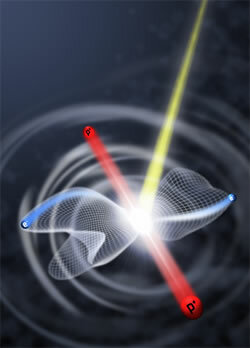 We have have introduced numerical continuation to track resonances in quantum mechanical systems. Numerical Continuation is frequently used in dynamical systems. The method can track transition betweenresonant and bound state in single channel problems, coupled channel problems with equal and unequal tresholds. Scattering and breakup of molecular systems. T.N. Rescigno, W. Vanroose, D.A. Horner, F.Martin, and C.W. McCurdy, First principles study of double photoionization of H-2 using exterior complex scaling,Journal of Electron Spectroscopy and Related Phenomena 161 p85--89 (2007) PDF.